This book updates and reorganises Part One of The Fire and the Stones. In the most monumental study of the history of civilizations for several generations, Nicholas Hagger describes the grand sweep of history in the style of Gibbon, Toynbee and Spangler. He looks for the underlying patterns rather than the shorter-term political, economic or social movements. His unique interpretation is, firstly, to see religion as the basis for civilization rather than one element in its cultural expression. Saints, mystics, gurus, prophets, religious founders – it is these that drive history rather than kings and politicians. Secondly, it is to describe all religions as part of a common vision, that of the Light. The experience of the Light is described by mystics everywhere in the world, at all times. Over centuries it finds expression in laws, buildings, churches, religions, which in turn eventually crumble. 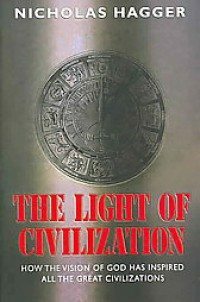 The third element in Hagger’s analysis is relating Light-inspired religions to their cultures and civilizations, tracing the process, common to all civilizations, where they decline as the original fire of the Light is lost. Finally, in this updated version of his thinking, he looks at the implications for Western civilization today, facing huge changes like the collapse of the Soviet empire and the hostility of much of the Muslim world, and offers pointers to the future. At the source of civilisations can be found religions, and at the core of all religions and historical traditions is the experience of the Light, although it is interpreted differently in different religions. A former Professor of English Literature who has spent a number of years living in Asia and the Middle East, Hagger has excelled in The Light of Civilization with a unique stance that gives mystics, prophets, saints and shamans more credit than kings and politicians for driving history. Hagger discusses the origin of the Light and the meaning of its experience. He elaborates on the tradition of the Light from 25 sources including the Mesopotamian, Egyptian, Israelite, Celtic, Iranian, Andean, African and Chinese, explaining also how the experience of the Light in these regions helped shape these cultures and civilisations. He then analyses a variety of subsets where “heretical” Light traditions have influenced Western civilisation, e.g. the Essenes, the Templars, the Grail Knights, the Kabbalists, the Theosophists and the New Agers (whose origins and ascendancy he analyses). Finally, he discusses the philosophy of history and touches on the implications of this Light knowledge for the future of Western civilisation….Brilliant! Nicholas Hagger’s books reveal truths that have been hidden, and are rewarding. He is a cultural historian who has devoted much thought to unearthing the pattern of history, and he presents a new approach to the history of 25 civilizations and to the philosophy of history.